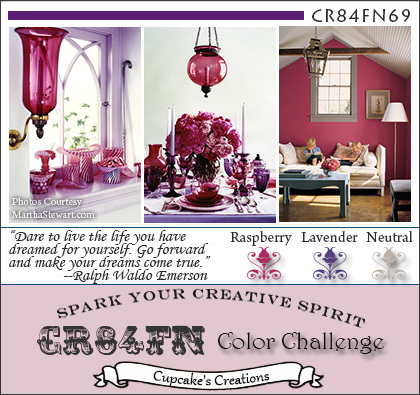 The colors are from the fun color challenge over at CR84FN and they are raspberry, lavender and neutral, a dynamic color combination, indeed. As stated above, I rarely make a card without using something from the MFT store, and usually I use many items, particularly their dies. 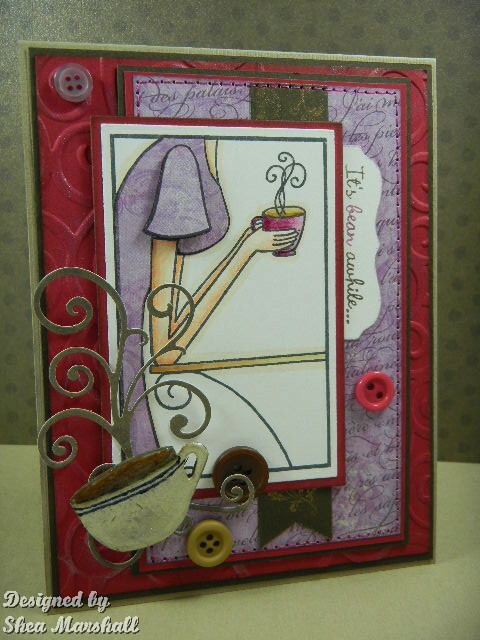 They have a fantastic selection, and for this card I cut all of the layers using their Rectangles Stax Sets 1 and 2. You might wonder why anyone would buy plain rectangular dies when you could so easily cut perfect rectangles with a paper cutter. Well, with both Stax sets, you get perfect 1/8" gradations in size without going through the brain damage of measuring and remembering where to make the decreasing (or increasing) size cuts. Believe me, I've ruined many a piece of CS by not measuring properly before making the cut, and since I knew I would be needing many rectangles on this card, this was the foolproof way of getting them. BTW, even if you only buy one of the Rectangular Stax sets, you still get perfect 1/4" gradations. This holds true for all of their Stax sets, i.e. circles, ovals, etc. I chose a MFT stamp set that I hadn't yet used before called "Coffee? Tea?" and I immediately knew that I wanted to paper piece the dress. Recognize it? It's the same as the paper which I used on the middle layer, except I stamped that layer with Perfect Plum using a French script stamp, En Francais by SU. I also pieced the sleeve and popped it up on dimensionals. I first learned of this technique at a wonderful blog, "In Rosie's Book" that you should check out. This lady is a phenomenal paper artist who continually inspires me with her creative, precise, and out-of-the-park gorgeous techniques. I colored the image's skin and coffee cup with Copics and glazed the cup with Glossy Accents then used a Spica glitter pen for the "steam." To the left, you can see the depth that the piecing gives the image. And to the right is the coffee cup in detail. This little stinker gave me quite some trouble. I wound up making three of them, learning something each time. The final result came about like this: I stamped the image from the stamp set onto light, light tan printed paper, adhered it to a scrap of white CS, cut out the image, then applied three layers of UTEE (Ultra Thick Embossing Enamel) to the surface. I wasn't happy with the final result - it was too dark, I guess because of the paper's reaction to the heat, so then I painted the cup portion with a blend of Ivory and Tan Creative Inspirations paints and the coffee portion with Chocolate [CI Paints]. It looked better but still needed something, so I coated the entire piece with Glossy Accents. When that dried, I drew on the black lines with a Sharpie. I give credit to my DD for that little detail. Sometimes it helps to have a second set of eyes when you're frustrated with something. And because of all of the surface treatment, you can't even see the original print of the paper. Oh WELL. 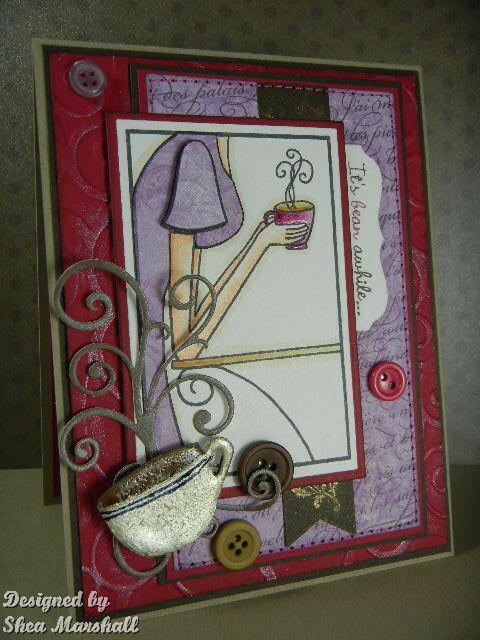 Underneath the cup is a brown Dienamics Fancy Flourish die cut which mimics the steam rising. If you'll look closely at the entire card, you'll see that the bottom raspberry layer has been embossed with the Cuttlebug D'Vine Swirls embossing folder, then lightly brushed with CI Paints Tickled Pink. 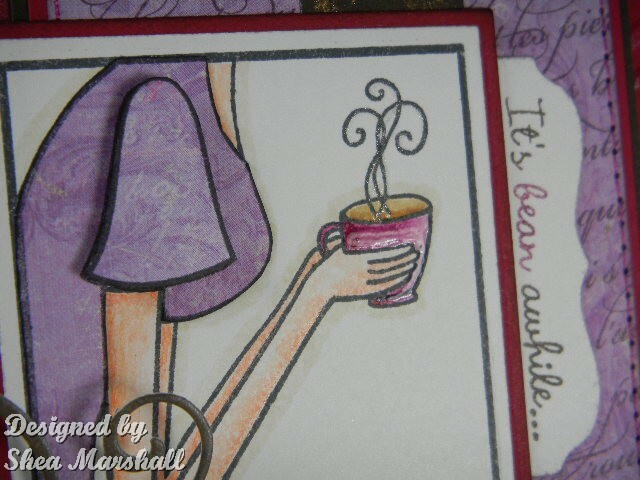 I was going for a swirl theme here to mimic the steam which rises from the coffee cup. I also stamped a swirly flourish on the Fishtail Flags Layers Stax and applied Perfect Pearls in Copper to it for a bit of added zing. Then I adhered it to the middle layers and stitched around the edges with raspberry embroidery thread. 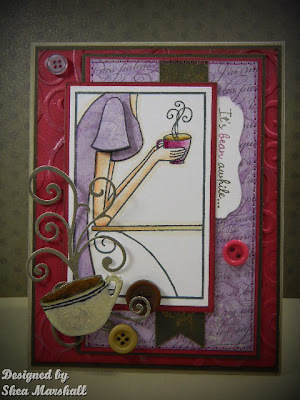 The sentiment is stamped using brown and raspberry markers onto a die cut using the Dienamics Mini Tabs Quartet. 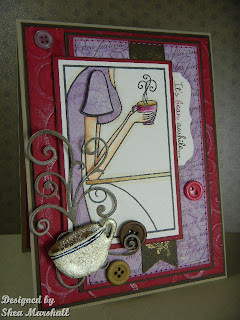 After all that, a few vintage buttons finished this card. The inside is finished simply with a couple of layers of CS and a couple of stamps from the set. Thank you for joining me today. 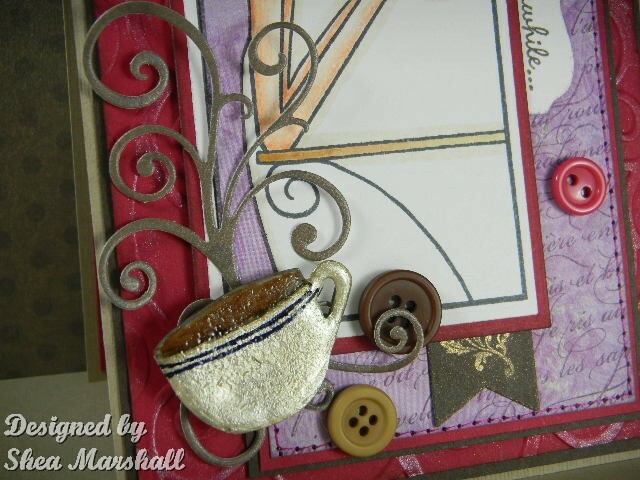 This card is unusual for me in that it has neither ribbons nor flowers, but I don't mind - the coffee cup and flourish "steam" rising from it satisfied my need for embellishment. Ok, and the buttons too. Have a lovely day, and happy crafting!! Extras: Rectangular Stax Sets 1 and 2, Fishtail Flax Stax Layers Set, Fancy Flourish, Mini Tabs Quartet (all Dienamics), vintage buttons, Perfect Pearls, CI Paints, UTEE, Sharpie, sewing machine, Cuttlebug D'Vine Swirls ef, Glossy Accents. This is just super! 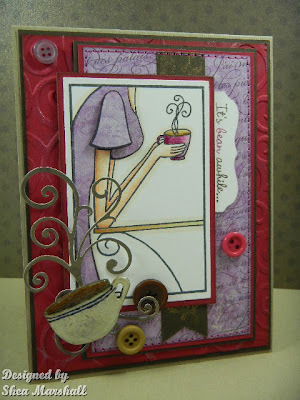 I'm a coffee lover, so this one really appeals to me - love the pretty layers and the coffee cup is ace! Thanks for playing along with CR84FN this week! This is just fantastic. 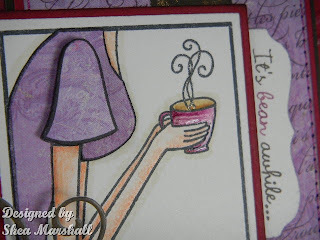 I love all the little details, the piercing of the dress, the cup, the steam, and of course the lovely buttons. Love it!!! Gorgeous card, Shea. Love the design, colour palette and all the elements you used. Had to pop over (I know I'm slow) and say thank you so, so much for all the love you left on my blog and over on SCS! I am so happy to know you like my work, it is a huge compliment to me! 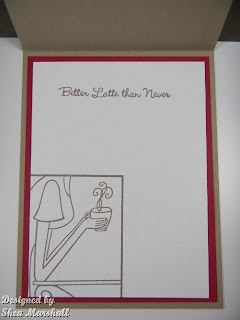 I spent some time clicking through your blog as well and oh my word, you have gorgeous creations posted! I love them! Stampers are the nicest people, I know this because of sweethearts like you! Many thanks for your encouragement! It means the world to me!! Love this image...it's me every morning!! 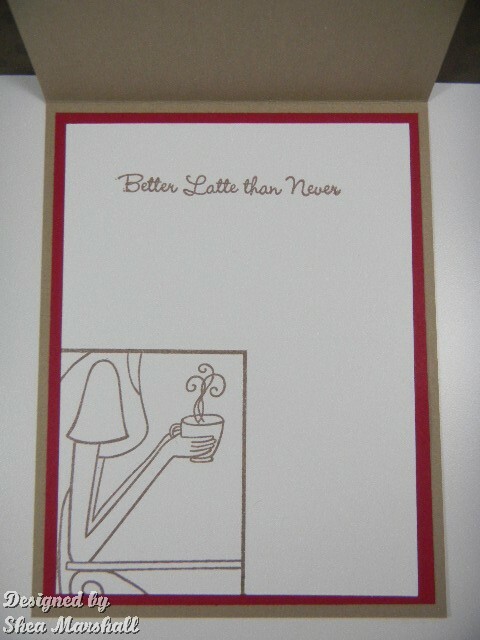 The popped up sleeve and coffee cup are perfect! Thanks for joining us at CR84FN!! Shea, this card is just FANTASTIC! LOVE the popped up cup and the flair of steam! THX for playing with us at CR84FN! Absolutely gorgeous! You captured the colours perfectly! Just wonderful, so much amazing dimension to this card and the colours look wonderful. Thank you so much for playing along with us at CR84FN this week and good luck with the MFT GDT competition too! 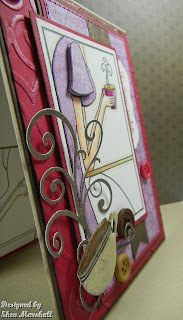 Stunning card with such fabulous details! LOVE the coffee cup! Thanks for playing with us at CR84FN! Congrats on the Terrific Top Three! Good luck on being a GDT over at MFT. That would be quite a coup. 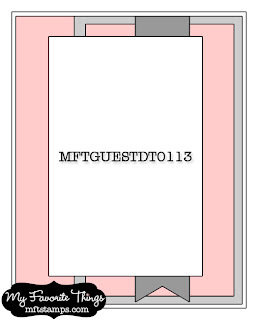 Digidarla New DT Member - First Card! Digi Darla Newest DT Member! A Gem of a Challenge - Holidays! Inspired by Stamping Guest Designer! 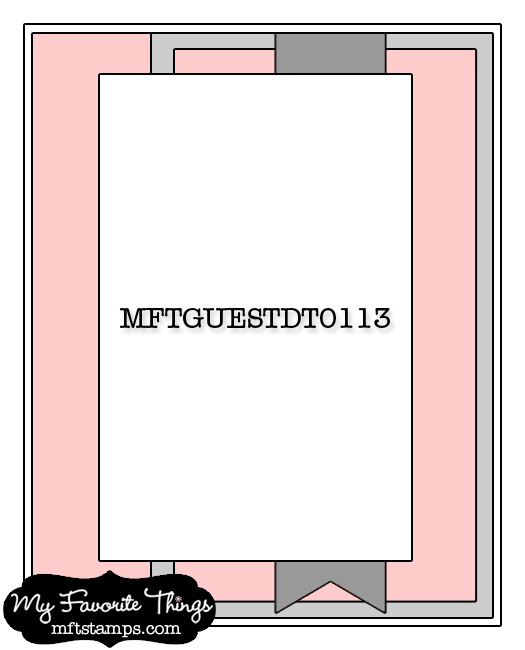 Love to Create Guest Designer! Challenge Day at Tuesday Alchemy!